So you have just bought a pair of edgy red footwear but perplexed about how to carry it. No need to frown as we have some quick styling tips for you. Wearing red footwear is trendy but can look like a style blunder, if color matching is not proper. So choosing the suitable attire is going to create red shoes the best fashion ever. For a guy, embracing any dark color in their wardrobe can be an embarrassment. So there's no question that adding red to a guy's look may look like teeter on the matador if not carried appropriately. You must not fall into that category, but, learn how to add some red color to your look for some style growth. If there is one place guys feel a bit of freedom is to flaunt their style with shoes. Donning a pair of red shoes can elevate your style quotient but if you come from non-fashionable background then it's a problem especially with some serious colors like Red. 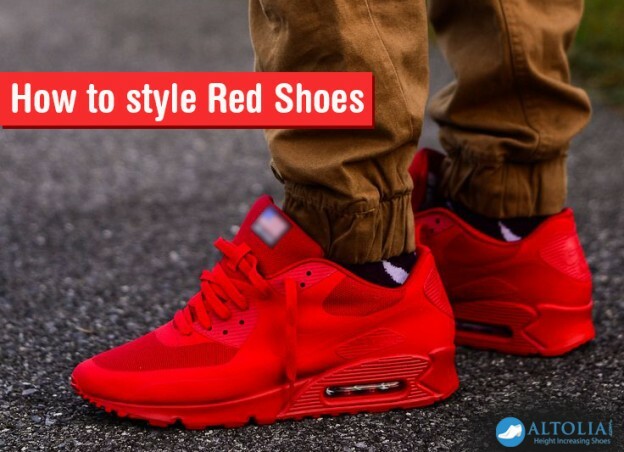 To flaunt your style with red shoes here are some styling tips. Red shoes can give you an elegant look with a pair of skinny jeans. Avoid wearing it with pink or purple shirts and avoid clashing your red shoes with a top. Black and white outfit with red shoes can bring an amazing look of shade you want to be noticed in the public. Another option can be, a casual black suit or white pants with black jacket bring new look with red shoes. Black on black outfit can be boring unless and until you wear red shoes with them. Patterned outfits with red shoes will highlight your color scheme. A shirt having small red outlines will turn accented by the shoes. You can even go for a tropical designed shirt having vines or even flowers compliments with red shoes. It's perfect if you wear multiple red pieces in one look; make sure to have proper space between them. Always remember, Santa Claus is the only guy that looks great with all red. Now, you can carry your red shoes with panache without committing any fashion blunder.